The global submarine sensor market is anticipated to expand at a compound annual growth rate of 3.6% during the forecast period 2017 to 2025, rising from a valuation of US$230.48 mn in 2016 to US$315.17 mn by 2025. Based on type of sensor, the global submarine sensor market has been segmented into sonar sensor, acoustic sensor, fiber optic sensor and electromagnetic sensor. Acoustic sensors garnered the maximum revenue in 2016, and are anticipated to expand at significant compound annual growth rate during the forecast period. The electromagnetic sensors are anticipated to witness sluggish growth during the forecast period. On the contrary, acoustic sensor help detect sound “pings” in order to determine the contours, speed and range of an enemy ship, submarine or approaching weapon. Acoustic sensors are used for anti-submarine warfare and mine countermeasures. The submarine force is making significant, rapid improvements in acoustic sensors and processing. For acoustic sensors, emerging technologies will help expand the possible location options for outboard sensors, while also improving the overall performance of these sensors even at higher submarine speeds, and reduce their cost and complexity. Submarine sensor market, by submarine type has been classified into nuclear-powered attack submarine (SSN), ballistic missile submarines (SSBN) and diesel electric submarine (SSK). Nuclear-powered attack submarine (SSN) were the largest contributor to the market in 2016 and accounted for a substantial share of the global market. Diesel Electric Submarine (SSK) are estimated to record decent growth during the forecast period. Based on application, the global submarine sensor market is segmented into marine environmental monitoring, underwater species protection, detection of oil resources, underwater communication and others. Underwater communication held a largest share of the market in 2016 and is estimated to expand at a healthy growth rate during the forecast period. Applications of submarine sensor in marine environmental monitoring and detection of oil resources industry is anticipated to register highest compound annual growth rate from 2017 to 2025. The submarine sensor market has been geographically classified into North America, Europe, Asia Pacific, Middle East and Africa and South America. North America acquired the largest share of the market in 2016 and was followed by Europe. In 2016, North America and Europe collectively held approximately 49% of the global market. Asia Pacific is projected to be the fastest growing region for submarine sensor market during the forecast period. In Asia Pacific, the increased demand for submarines such as diesel electric submarine (SSK) is expected to be the key driver for economic growth of this region, which is anticipated to fuel the growth of submarine sensor market during the forecast period in this region. Some of the major players in the global Submarine Sensor market are: ATLAS ELEKTRONIK, Harris, Lockheed Martin, Northrop Grumman, DRS Technologies, Ducommun, L­3 KEO, Safran Electronics & Defense and Raytheon among others. The global submarine sensor market report provides analysis for the period 2015–2025, wherein the period from 2017 to 2025 is the forecast period and 2016 is the base year. The report covers all the major trends and technologies playing key role in submarine sensor market growth over the forecast period. It also highlights the drivers, restraints, and opportunities expected to influence market’s growth during the forecast period. 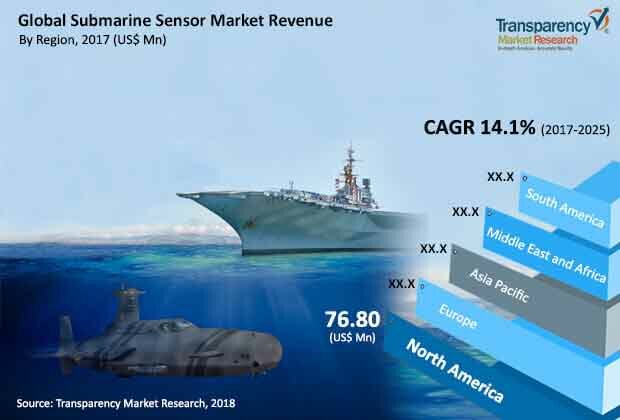 The study provides a holistic perspective on the submarine sensor market’s growth throughout the above mentioned forecast period in terms of revenue (in US$ Mn), across different geographies, including North America, Europe, Asia-Pacific, Middle East & Africa (MEA) and South America. The market overview section of the report demonstrates the market dynamics and market trends, such as the drivers, restraints, and opportunities that influence the current nature and future status of the market. An attractiveness analysis have also been provided for every geographic region in the report, in order to provide a thorough analysis of the overall competitive scenario of the submarine sensor market, globally. Moreover, the report provides an overview of the various strategies of key players present in the market. Introduction and market definition chapter helps in understanding different technologies of submarine sensor along with their applications which are included in the report.